For the longest time, I thought I didn't like green tea. 'I thought it tasted burned, and it gave me dry-mouth. However, once I learned to make it the right way, my world was changed! 'Now let's change yours. 'I decided to make two different green teas to show you that not all tea is the same and that even if you're convinced you 'don't like green tea', that you might change your mind! First, you need some tea. 'I used Rishi Tea's Bancha, and Emerald Lily. Notice the difference between the teas? 'Even though they are both green teas? 'That just goes to show you how different teas can be from each other. 'Also, make note that I am using full-leaf tea, which is the best kind to use. 'Most tea that comes in a bag is just bits and pieces, which can also contribute to bitterness and generally a poor tasting cup. I use plastic filters to put the tea leaves in before I put them in my cup. There are many tea-making devices out there. Feel free to use the one that works best for you! Here's the thing about green tea. Green tea doesn't like boiling water. 'It doesn't like it at all. As long as you can remember this, you're golden! 'What I like to do is just go ahead and boil the water, and then have a little bit of cold water running or ready to bring the temp of the water down. 'Technically, green tea likes water around 180-185 degrees, but I don't really like to get that technical. As long as it's hot but not boiling, I assume I'm close. Now, let the tea steep for about 5 minutes. 'Make sure to follow the directions on whatever tea you're using because steeping times can vary between teas. 'I use about 1 tablespoon of tea per 8 ounces of water for green tea. How did these teas taste? 'I found the Bancha to taste a lot like something you might get at an Asian restaurant, but better. 'It was the kind of tea I would want to drink on a cold morning in the fall or winter. 'The Emerald Lily was a bit more floral, and would work well for an iced tea. A couple of notes, since there won't be a recipe per-se. 1. 'Buy good tea. 'I can't say enough about Rishi Teas. 'I think they are the best, but basically just try to find full-leaf tea from a respectable store or tea shop. 2. 'Follow the directions on the tea, if it comes with any. 'Otherwise, for a green tea, remember not to pour boiling water on it, and you'll be safe. 3. 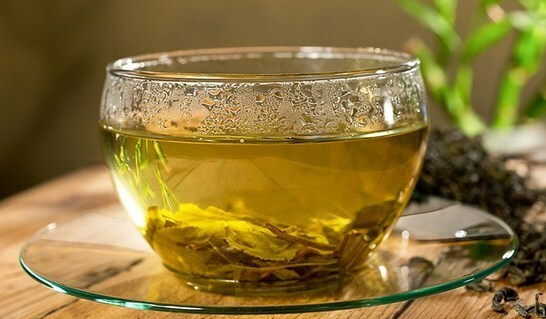 'Use about 1 tablespoon of tea per 8 ounces of water. 'Oh, and try to use filtered water! 4. You can reuse your leaves! 'Yes, this makes full-leaf tea much more affordable when you factor in being able to reuse your leaves. 'Just try to use them again in the same day, but when you make your second cup, let it steep a minute longer than the first time. 5. 'You can decaffeinate tea yourself! 'Just let the leaves steep about 20 seconds, then dump the water out, and steep according to the instructions, and you will have decaffeinated tea! 'There might be a little left, but it won't be much. 6. Enjoy! 'Green tea can taste good!